Is money the most important factor in being ready for college? Because whatever your academic credentials are, it’s good to be rich. Posted in rising costs of college | Comments Off on Is money the most important factor in being ready for college? What is the most important secret for a SAT ‘Perfect Score’? 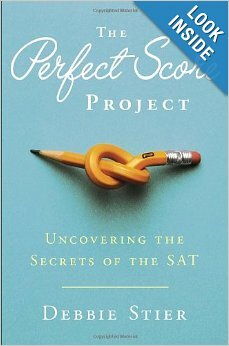 The Perfect Score Project: Uncovering the Secrets of the SAT by my friend Debbie Stier is described as “one of the most compulsively readable guides to SAT test prep ever”. As it climbs the charts in popularity, this book is attracting praise as “a toolbox of fresh tips”, as well as some criticism that it is the work of a “hyperprotective, status-seeking” helicopter mom. The criticism seems to stem mainly from some selective editing in the book’s promotion, and clarification is provided over at Kitchen Table Math. While there’s no doubt that Debbie is a very involved parent, I can attest that she does not fit the image of an overbearing, pushy mother. In fact, she has helped me in gaining better insight into the type of supportive parenting that is instrumental in launching children to a satisfying and independent adult life. … if you have a solid foundation, test prep, great test prep works. if you don’t have a solid foundation, no amount of test prep can help you. Posted in applying to college, back to basics, before college, high school, K-12 education, parenting | Comments Off on What is the most important secret for a SAT ‘Perfect Score’? 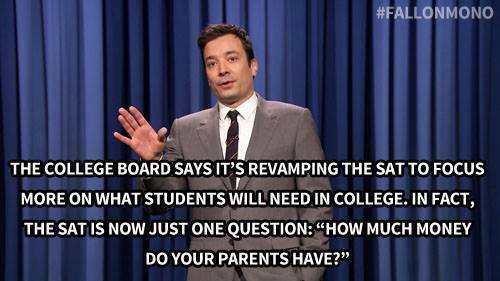 SAT changes that will take effect in 2016 were announced yesterday by College Board president David Coleman. Changes include an optional essay and a return to the 1600-point scale. • The essay, required since 2005, will become optional. Those who choose to write an essay will be asked to read a passage and analyze how its author used evidence, reasoning and stylistic elements to build an argument. • The guessing penalty, in which points are deducted for incorrect answers, will be eliminated. • The overall scoring will return to the old 1600 scales, based on a top score of 800 in reading and math. The essay will have a separate score. • Math questions will focus on three areas: linear equations; complex equations or functions; and ratios, percentages and proportional reasoning. Calculators will be permitted on only part of the math section. Khan Academy will offer free test preparation materials online. During the transition more students will take the ACT. As the parent of a teenager, I foresee more students shifting their focus to the ACT until after the new SAT has been in use for a couple of years. That trend is already in place, and few students will want to rely on the new SAT as the sole test to use in the college application process. … only 43 percent of SAT takers among this year’s freshmen are ready for the academic rigors of college studies. College readiness is determined by meeting the SAT College and Career Readiness Benchmark score of 1550. 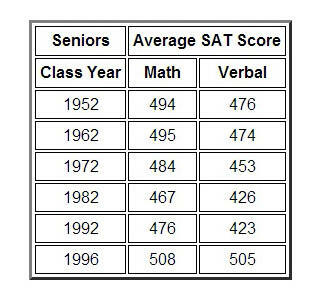 … The SAT Benchmark score of 1550 is associated with a 65 percent probability of obtaining a first-year GPA of B- or higher, which in turn is associated with a high likelihood of college success. Studies show that students who meet the SAT College and Career Readiness Benchmark are more likely to enroll in a four-year college, more likely to earn a higher first-year GPA, and more likely to earn a higher first-year GPA, and more likely to persist beyond the first year of college and complete their degree. SAT math scores have stagnated over the last six years while reading scores have slipped. Students planning to major in some of the liberal arts and sciences performed significantly better than many who are aiming at more vocationally oriented degrees. Students wishing to major in multi/interdisciplinary studies earned the highest combined SAT score (1757), followed by the physical sciences (1673), English language and literature (1665), and social sciences (1661). Significantly lagging behind were students hoping to major in three of the most popular fields — education (1442), psychology (1484), and business management and marketing (1497). Some of the lowest scores came from students wanting to major in parks and recreation (1328) and construction trades (1274). Jessica Nevitt is a middle school English teacher who found her own whole-language education left her with a shaky understanding of grammar, a problem that became apparent when she took her SAT test. Now she is trying to make grammar instruction more engaging for her students by using Mad Libs. … Grammar is a subject that I have struggled mightily with, as a student and a teacher. My elementary school experience made me a product of the “whole language” movement. My teachers emphasized the importance of reading and daily journal writing, which in turn, translated into a grasping of the English language, which was organic and boundless. The rote memorization of grammar rules through charts and workbooks, a hallmark of more traditional forms of grammar education, was seen as archaic and even inhumane. Because I was both an avid reader and writer, the whole-language approach allowed me to understand grammar in context, without forcing me to spend countless hours memorizing charts and squelching my creativity. Although this approach seemed successful, it was not until years later that I realized something was missing. During my first attempt at the SAT exam, I nearly passed out when I encountered the then-recently developed “writing” section. The questions asked me to select, in multiple-choice style, the grammatically correct version of a given sentence. I used my intuition, based on years of whole-language reading and writing experience, to guess at the correct answer, and managed to squeak by. But it became clear at that moment just how clueless I was about grammar. When she found her own students struggling with “dangling modifiers, participial phrases, subjects and predicates”, she decided to supplement traditional grammar instruction with Mad Libs. Mad Libs — the popular children’s word game that requires players to fill in verbs, adjectives or other words to tell a story — is perhaps the single greatest grammar tool I have used to engage my students. With the first few Mad Libs that we completed, the students had fun coming up with “silly” words that fit the part of speech required. However, as they gained a greater mastery of the parts of speech, we began to discuss the nuances of word choice and the incorporation of more sophisticated adjectives and verbs. Thus, grammar became a gateway for the teaching of writing. Ultimately, the end goal of this exercise is to have students create their own Mad Libs. Students will have to form their own sentences with blanks, leaving out a particular part of speech. By doing this, students will not only gain a better understanding of the different roles that words can play, but also gain an understanding of the relationship between the parts of speech and the structure of a sentence. Apparently Mad Libs is quite popular as a teaching method, as I learned when I Googled mad libs grammar worksheets. I’m sure that teachers find it engaging, but I have a lingering doubt about its effectiveness. While I realize that students must be engaged to learn, too often I hear educators stress the importance of “engaging” students over the importance of actual learning. My sense of uneasiness is amplified when teachers like Nevitt write about how our school children are used as guinea pigs in the classroom. Schools are not required to obtain permission from parents or undergo IRB review in order to conduct research using their students as human subjects. All that being said, based on years of research the National Council of Teachers of English recommends against teaching grammar in isolation. … ample evidence from 50 years of research has shown the teaching of grammar in isolation does not lead to improvement in students’ speaking and writing, and that in fact, it hinders development of students’ oral and written language…. Resolved, that the National Council of Teachers of English affirm the position that the use of isolated grammar and usage exercises not supported by theory and research is a deterrent to the improvement of students’ speaking and writing and that, in order to improve both of these, class time at all levels must be devoted to opportunities for meaningful listening, speaking, reading, and writing; and that NCTE urge the discontinuance of testing practices that encourage the teaching of grammar rather than English language arts instruction. I think the optimal situation would be for schools to use lots of grade-level reading and writing along with explicit grammar instruction. For most students, that combination would probably be the best. Learn grammar. It will help your SAT score. A parent raises their hand in the information session at a very competitive college and says that Sally has low SAT scores or a less than perfect GPA, and wants to know if she will still be considered. The very diplomatic speaker says “We look at the whole student and all their accomplishments, not just GPA or SAT scores.” I have yet to see a kid with a 3.0 or 500s get into an Ivy League, Stanford, Duke or Georgetown unless they are a recruited athlete, just played Carnegie Hall, or their uncle donated the library on campus. Yet parents come into my office every month with the unrealistic hope that their child will now be in contention at a college that is ridiculously out of range. The truth is that colleges look at the whole student if your SATs and GPA make the cut, and the bar is VERY high at top colleges. Otherwise, you must have something AMAZINGLY compelling about you to propel you into consideration. Simply loving the guitar or horseback riding, probably isn’t going to do it. Read about more ‘Biggest Lies in College Admissions’ from GoLocalProv.